What's that ice falling from the sky? I was scrambling for a blog, but Universal Desk Editor Kelly Lipp shrugged it off as a generational “thing” -- and, by the way, why not just post the immediate conversation? Fine, she had me. We were discussing weather, coverage of weather, and how we were going to get the upcoming special section for hurricane season produced. Yawn? Probably not, with the hurricane season officially staring at us in two weeks. We had hail for a few minutes yesterday afternoon, and Manatee natives wondered what in the heck that ice was falling out of their sky. For those of us who have spent time in Texas, we recall without fondness scrambling to get our cars under shelter too many days during spring hailstorms. Here’s hoping predictions are only fodder to get us prepared. We needed the rain; but hurricane, hurricane go away. Later today, we'll post breaking news on The National Oceanic and Atmospheric Administration's outlook for the 2009 season. Stay tuned. The Golden Heralds Awards were phenomenal again this year, thanks to the stellar cast of candidates, judges and sponsors. I salute all the winners in my column today. One of the coolest aspects of the Golden Heralds -- they are part of this community's historic fabric, whether 32 years ago or last year. Countless resumes have crossed my desk, proudly listing "Golden Herald finalist" as an accomplishment worth considering. As this year's event was coming to a close, a young woman approached me, with her mom and sister in tow. It was Melissa Quinn, a 2008 Golden Heralds winner in Journalism. She had recently contacted me about interning at the Bradenton Herald -- she's now a student at the University of Florida, majoring in journalism. This night, however, was not about her. It was all about her little sister -- Christine Quinn, who had just won the 2009 Golden Heralds' Honorable Mention in Music. "I'm so proud of her!" Melissa gleamed as she introduced her sister again. We're proud of both of you. And to all of you who help support the Bradenton Herald's annual recognition of outstanding seniors, thanks for making it a family tradition. The event is from 10 a.m. to 4 p.m. Saturday at the Sheriff’s Office District 2 location, 407 57th Ave. E.
Unfortunately, you've seen more stories missing that last line recently. Our computer system is adjusting stories after they're on the page, and if the copy editor doesn't catch it -- well, the last line gets eaten. We're working on getting this fixed immediately. Blogging about moms and Mother's Day is quite a non sequitur for me. You see, my mother has never owned or even used a computer. Never had one inside the house, I'd wager. So unless my brother takes her a printout of this, I'm on safe turf. Never. Moms always know, you know. Whatever I write here somehow reflects on that bond I have with my mom -- the bond every human being has with his or her mom, whether it's joyful, painful, blessed or bewildering. Moms do that to their kids. That's reflected in the Mother's Day words sprinkled in the Herald today. Columnist Vin lost his mom last year, and he writes a reflective, personal column today about the last journey he has planned with his mom, to Ireland. Reporter January Holmes captured the sheer selflessness of so many moms, in her A&E feature asking local moms what they wanted on their day. Their wishes are laced with longings for more family time rather than tangible gifts. And photojournalist Tiffany Tompkins-Condie forces us to pause and think about the unthinkable in her Mother's Day blog this morning. She writes about two moms who have lost their Marine sons in a helicopter crash. That loss redefines the selfless acts of motherhood. But more than anything, today is a day to celebrate Moms everywhere. Whether their children are near or far (Alissa, I don't think there's a place farther from Bradenton than New Zealand!! ), my wish for all moms is a hug and a kiss from a loved one today. 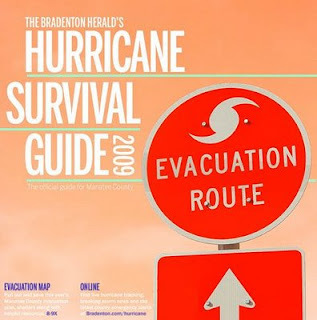 This week, the size of the Bradenton Herald's print edition changed. It's now on a narrower page. Little was lost in content, thanks to the wizardry of Presentation Editor Jennifer Conklin, who rebuilt all the templates used to produce each page. Publisher Bob Turner wrote a short column introducing the changes, noting that the classified section was redesigned into a format that's actually much easier to read. I thought I'd share some of the feedback we've received -- good and bad. The good news: Most of you responded positively, noting that belt-tightening was happening everywhere. And you had some helpful suggestions, particularly on the Money & Markets page. Thanks to your feedback, we restored commodities, foreign exchange and treasuries/bonds starting today. (And that amazingly popular little item – the telephone stocks!) Another frequent question was on the size of type. The answer: It's exactly the same, not any smaller. Sure, some of the comments were downright nasty, and that always stings. I know we’re messing with a daily habit, which is why we put so much work into making the change as seamless as possible. But hurtful comments don't help; we're listening to your suggestions and will try to accommodate as much as possible. Here’s a sampling of your emails, including those that helped us revise the markets page. to lose my BH morning paper. I miss the section of the world currency the Euro and all the other currencies. We do a lot of traveling thru out the world, and I like to keep up on their currency. Otherwise, nice format of the paper and interesting! Keep up the good work! Thank you for making ALL the classified ads easier to read. Ever since you folks have reduced your TV guide to a point where some late movies can be missed because you have not listed them anywhere... I knew more cuts would be coming. When the time comes, I will really consider whether to purchase another yearly subscription to your paper or cut you out. two years ago and work to getting back to that standard when times afford. I really like the size of your new format. It is easier to handle and pictures are more pronounced. Who says adding economy can’t improve something??!! Great Job! Let us know what you think, too. We are listening. Replacing the Anna Maria Island bridge is one of the more emotion-packed, history-evoking debates in Manatee County. Our island has preserved a lifestyle all its own, yet time marches on -- and change becomes inevitable. In the past year, the Florida Department of Transportation has conducted three surveys with the stated intent to gauge public sentiment on what to do with the aging drawbridge when it reaches the end of its expected lifespan in 10 to 15 years. But Herald transportation reporter Duane Marsteller questioned the methodology and results. Who responded to the survey was key. Through a public-records request, Duane obtained PDF copies of public-opinion surveys submitted to the Florida Department of Transportation in March and April. He used property and tax records to confirm residency. The results don't change: The survey found that a high-level, fixed span drew overwhelming support from island residents, even more than among non-island residents. But what Duane confirmed with his analysis: Those results might mean little, because FDOT used a survey method that has little or no statistical validity, a public-opinion research expert says. Read his story in today's Herald and here online.